Have you noticed anything about the grass verges and hedgerows? It might depend on where in the UK you are – and whether your council has seen swingeing cuts under the government’s austerity programme or not – but there’s something different this year. 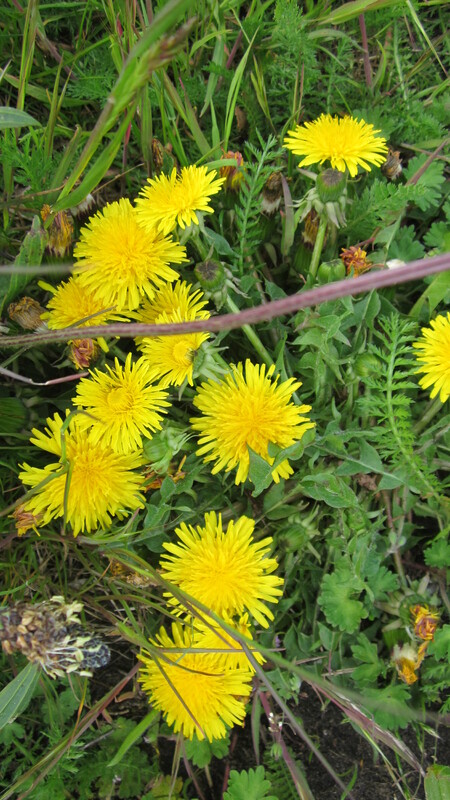 I noticed it first when we were out in the Lancashire countryside – the hedgerows were full of dandelions. Then I realised that even in town, the grass verges on most of our main roads are brightly blooming yellow. Our council services have been cut back. It’s not just closing libraries and police stations or the sacking of park staff, but also, it seems, regular grass mowing. I never thought I’d be pleased to see council cuts – but this one I relish. Spring has sprung yellow all over – and it’s almost enough to cheer me up about the world. I’ve been umming and ah-ing about this post. Everyone’s tired of political posturing as the election campaign here reaches its climax. The last thing anyone needs is a blog post from me on the subject. Which is why, instead of ranting on about how much I care about who forms the next government, I’m going to tell you why a treasured purple cushion is a bit of a touchstone for me. I’m newly arrived at university. A knock comes on my door. Outside stand two nice people asking me to join the Conservative Association. I say yes and pay my dues. I doubt it cost me very much – in those days I was living on an allowance that my dad misread as being ten pounds a month. It should have been ten pounds a week. There was much rejoicing at the Oxford branch of Laura Ashley when he realised his error. Anyway, I joined the Conservative Association. My father was a Conservative – as headmaster of a boy’s grammar school he was vehemently against comprehensivisation – though I don’t know if that was his only reason. My mother, meanwhile, was Liberal by inclination – like her mandolin-playing, wholesale fruiterer father. We lived on the edge of a big city. The green belt began behind us, with views over fields stretching as far as the eye could see. About twenty minutes’ walk down the main road was our parish church. The parish was largely made up of a big council estate, where several of my schoolfriends lived. Our priest was a lovely, erudite Irishman whose accent I frequently found impenetrable – but one phrase he used so frequently there was no mistaking it. That was us. We were his brethren, all of us. Father Hickey wore a beret in cold weather and drank whisky. He fried up daffodil bulbs by mistake when his housekeeper was away and was sick. He was a frequent visitor to our house, as a member of the board of governors of my dad’s school and as parish priest. During one election campaign he addressed the congregation from the pulpit and said it was their duty – because of the education policy – to vote Conservative. I was too young at the time to make much of that – but now I wonder – did his largely poor, working class parishioners do his bidding? At university I had no real political sense. Politics only impinged on me when Oxford Union elections were due and parties were given – then everyone wanted to be my friend. One of the real friends I made there was a Labour activist. After university he joined a nationalised industry – the National Coal Board. By the time of his early death he had been a banker, retired – filthy rich – in his thirties and gone over to what he once would have thought of as the dark side. The Conservatives. I was still largely unaligned. I’d gone from being an accidental journalist, specialising in telecommunications, to a PR person. Because of my telecoms background I ended up working for a de-nationalised (as we used to say) part of British Leyland. Not the cars bit. Old BL had a unique communications network and a nascent email system that relied on acoustic couplers (old fashioned phone handsets that fitted into modems on typewriter-style equipment on the desktop). And paper. No screens. The recently privatised British Telecom plc – formerly part of the Post Office – was my next client. By now I’d begun to think more seriously about politics and when the Social Democratic Party was formed it got my vote. Then we moved out of London. I went from working as a consultant in telecoms and finance (a large bank was one of my clients) first to an insurance company, then to freelancing with glossy mags and a national newspaper. We became very poor – but happy – on my erratic earnings. Before going freelance, I’d been offered – and turned down – a major job in the pre-privatisation water industry. Poverty drove me to ask my contacts for freelance work – but instead they gave me the job. And what a job it was. I enjoyed water and sewage – it’s down-to-earth, essential in the truest sense. But we were the most loathed businesses in the country. Fat-cat bosses who once were local council employees were now running a vital service – and making loadsamoney. Labour politicians poured vitriol on us. Friends of the Earth ran a memorable campaign featuring taps running with poison. Ironic, that a campaigning environmental group was responsible for a boom in bottled water. All those plastic bottles. I worked like stink with my in-house team and a bevy of outside agencies supporting us. For the first time, I found myself working with men who got their hands dirty. I mean really dirty. Sewage treatment workers deserve medals. Water and sewage workers know they do a vital job and tend to behave accordingly, with incredible commitment. I met some fantastic people and was delighted to find families working in our big, jolly, family industry – sons, fathers, mothers, brothers – and so on. What great ambassadors for our company. Then came my Damascene conversion. We were forbidden to use any family stories in our endeavour to be seen as less loathsome. The ‘City’ – the money men – wouldn’t like it. We were big businesses now and supposed to be rationalising. I’ve always been a bit naïve. It took me quite a while to realise I was doing an impossible – for me – job. My official duty (when I became a director) was to pursue shareholder value above all else. We told ourselves the usual corporate fairy tales. If we treated our staff and customers well, provided a good efficient service, blah blah, that would enhance shareholder value. Except the usual corporate weasel words don’t work with a monopoly. Bring in all the regulators you like – they don’t take the place of two shops selling different products, one cheaper, but poorer quality. It was the most stressful job I’ve ever had. A twenty-four hours a day job for many of us, manual workers and office workers alike – and every single employee was at risk of being despised on admitting he or she worked for a water company. We managed, like water dripping on stone, to change attitudes. Became the least unpopular of the corporate lepers. I handed in my notice. Waiting for my terms to be agreed, a stream of key directors began popping in to see me, asking me to stay. We were making a takeover bid. A year later, when it failed, my voluntary redundancy terms were generous and I left with immense relief. By then I’d seen how nasty politics could be, if not all politicians. Our region was largely Conservative and I got on well with many of our Members of Parliament, MPs whose views were opposite to mine. But the underlying ethos, I now realised, was what mattered. I had chances to get involved during those years – I met a group of key Labour strategists for dinner in the House of Commons one night, for example – but I had no idea how to react. I always seem to work out how to use an opportunity after it’s gone. Now, far too many years later, I’ve joined a political party. It’s not ideal, but has at its roots a belief that unfairness and inequality are things to fight, that capitalism – unfettered – is not the answer to all our human needs. British politics, I know, can be confusing. One of my sisters-in-law once asked if Margaret Thatcher – the Conservative Iron Lady – was a communist. To an American that’s usually about as close to a devil on earth as you can be. So I understand her mistake. And I understand those who feel that socialism is too close to communism for comfort. But I’ve always felt quite comfortable with it because – wait for this – I’d be happy for everyone to have purple fuzzy cushions with a button in the middle. You see, when I was little, I asked my father to tell me what a communist was. I’d asked for and received a purple fuzzy cushion – with a button in the middle – for my birthday. It had pride of place on my bed. I wan’t one for lots of soft toys. And the luminous rosary was under my pillow. I’m sure he gave a decent explanation. May have mentioned Stalin and the purges – though I don’t remember it. What stuck with me was, ‘if you can have a purple fuzzy cushion everyone has to have one’. Well, that’s how my little mind interpreted it. And it shows you how important and misleading an analogy can be. So, come the revolution, it’ll be purple fuzzy cushions all round, in my ideal world. That, or perhaps more important, an end to a government that penalises the poorest for having one spare bedroom, whose fabulously wealthy chancellor claims child benefit from the supposedly impoverished state and gives tax breaks to the richest. I think Father Hickey would have been with me on this one. Brethren, vote for others, not for your own selfish interests. Oh, don’t get me started. We’re a rich country folks, the deficit in GDP terms is not historically high – and Labour was overseeing a period of growth before the Conservatives stopped it in its tracks. But never mind all that – we’ll cope. As long as someone is caring for the weak. And that surely shouldn’t be a Government that’s seen food banks spread like weeds in our rich, comfortable country. I’ll take a risk, thanks. And sorry for talking about politics after all. And for going on so long. I’m off out for some fresh air and life-affirming dandelion spotting now. This entry was posted in Britain now & then, Thinking, or ranting, or both and tagged bedroom tax, communism, Conservative, dandelions, deficit, enhancing shareholder value, food banks, Labour, privatisations, SDP, Stalin. Bookmark the permalink. Thank you for sharing your personal journey Mary. You’re right that it’s almost a schizophrenic endeavour to do good and do well in the corporate world. But, it’s a worthwhile endeavour. Perhaps you might consider giving your experience to a social enterprise? In any case, you’re bang on when you say = “unfairness and inequality are things to fight, … capitalism – unfettered – is not the answer to all our human needs.”. May ultimate British common sense be reflected in the results. I wish the politicians and bureaucrats would drop the posturing and self interest, and that the media would find something worthwhile to flog than such non-riveting details that the prime minister has been knocking back beers with football players! A popular and convenient suggestion, but not accurate. The G.O. and I cannot stand the Big 2 parties, so we both vote Green, and I’m happy to say in the local Sydney electorate I’m enrolled Labor was voted out and the Greens in. People Power! Typically, the G.O. is registered at our country location, where the Liberal-National-Country party has held the sets forever, but the Greens are giving them a run for their money. I’m not saying Australia isn’t doing well regardless of the political colour of whoever is running the country. It’s hard to feel like we are because like the Big Corporates those governing continually raise the stakes so we’re all about Big. The methodology seems destabilizing, and like Britain small important things are falling through the cracks. I see no reason for people to not have cushions of any color or kind if that’s what they want. But if we don’t need cushions don’t tell us we do. I’m tired of politicians telling people what’s good for them and not listening. (I wondered if you still had the purple cushion. I still have my first pillow and a huge yellow teddy bear both almost 50 years old). Hello, sorry I was being so impatient! Dandelions are much more pleasant than politics I agree, especially here and now. It’s tipping down with rain as if even the gods are upset. Thoughit was rather lovely this morning so maybe the gods are in two or more minds about human elections in very small countries. I’m gutted, I’ll be honest, all the polls were horribly wrong and we now have another 5 years of cuts to the poorest and most vulnerable – unless of course they were lying which is always a possiblity. They have form on it. Ah purple cushions. I agree, no one should be forced to alter their colour schemes under soft furnishings dictatorships! I have lost my luminous rosary, too, but I do have my bear, who hid beneath the covers with me and comforted me when I cried. He has a wobbly leg (a bit like me six weeks ago) and his nose is coming unpicked (so to speak) and he has Tex’s home made Eeyore for company now in our spare room. I can’t decide what to do with my political energies now. I was in two minds about the Green party earlie ras it has one or two policies I can’t accept – though of course it is the future – if there is going to be one. Hang in there… there’ll be another day, and things are changing, if slowly. In politics I think it’s only possible to support the option you least detest. If you wholeheartedly embrace all the philosophies, policies of any one, that would be a worry. 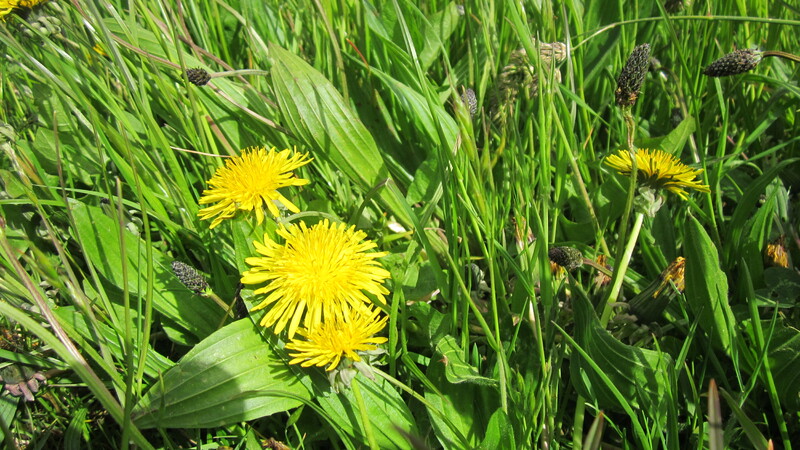 Dandelions have become political too, so varied is the thinking on them: food; weeds; weeds in the wrong place… there’s no avoiding it!